Although part of the United Kingdom, Wales has always had a representative side that plays in major professional tournaments, though not in the Olympic Games, as the International Olympic Committee has always recognised United Kingdom representative sides. During their history, Wales have qualified for two major international tournaments. They reached the quarter-finals of the 1958 FIFA World Cup and reached the semi-finals of UEFA Euro 2016. Wales also progressed through UEFA Euro 1976 qualifying to the quarter-final, which was played on a home and away leg basis, but they did not feature in the finals tournament. Wales played its first competitive match on 25 March 1876 against Scotland in Glasgow, making it the third oldest international football team in the world. Although the Scots won the first fixture 4–0, a return match was planned in Wales the following year, and so it was that the first international football match on Welsh soil took place at The Racecourse Ground, Wrexham, on 5 March 1877. Scotland took the spoils winning 2–0. Wales' first match against England came in 1879, a 2–1 defeat at the Kennington Oval, London, and in 1882, Wales faced Ireland for the first time, winning 7–1 in Wrexham. The associations of the four Home Nations met in Manchester on 6 December 1882 to set down a set of worldwide rules. This meeting saw the establishment of the International Football Association Board (IFAB) to approve changes to the rules, a task the four associations still perform to this day. The 1883–84 season saw the formation of the British Home Championship, a tournament which was played annually between England, Scotland, Ireland and Wales, until 1983–84. Wales were champions on 12 occasions, winning outright seven times whilst sharing the title five times. The FAW became members of FIFA, world football's governing body, in 1906, but the relationship between FIFA and the British associations was fraught and the British nations withdrew from FIFA in 1928 in a dispute over payments to amateur players. As a result, Wales did not enter the first three FIFA World Cups. In 1932, Wales played host to the Republic of Ireland, the first time they played against a side from outside the four home nations. One year later, Wales played a match outside the United Kingdom for the first time when they travelled to Paris to play France national football team in a match drawn 1–1. After World War II, Wales, along with the other three home nations, rejoined FIFA in 1946 and took part in the qualifying rounds for the 1950 World Cup, the 1949–50 Home Championships being designated as a qualifying group. The top two teams were to qualify for the finals in Brazil, but Wales finished bottom of the group. Wales made its only World Cup finals tournament appearance in the 1958 edition in Sweden. However, their path to qualification was unusual. Having finished second to Czechoslovakia in qualifying Group 4, the golden generation of Welsh football managed by Jimmy Murphy seemed to have missed out on qualification, but the politics of the Middle East subsequently intervened. In the Asian/African qualifying zone, Egypt and Sudan had refused to play against Israel following the Suez crisis, while Indonesia had insisted on meeting Israel on neutral ground. As a result, FIFA proclaimed Israel winners of their respective group. However, FIFA did not want a team to qualify for the World Cup finals without actually playing a match, and so lots were drawn of all the second-placed teams in UEFA. Belgium were drawn out first but refused to participate, and so then Wales was drawn out and awarded a two-legged play-off match against Israel with a place in Sweden for the winners. Having defeated Israel 2–0 at the Ramat Gan Stadium and 2–0 at Ninian Park, Cardiff, Wales went through to a World Cup finals tournament for the first—and currently only—time. The strong Welsh squad made their mark in Sweden, drawing all the matches in their group against Hungary, Mexico and Sweden before defeating Hungary in a play-off match to reach the quarter-finals against Brazil. However, Wales' chances of victory against Brazil were hampered by an injury to John Charles that ruled him out of the match. Wales lost 1–0 with 17-year-old Pelé scoring his first international goal. The goal made Pelé the youngest World Cup goalscorer and Brazil went on to win the tournament. Wales had never qualified for the finals tournament of the UEFA European Championship since its inception in 1960. However, in 1976, the team managed by Mike Smith reached the last eight of the competition, having finished top of qualifying Group 2 ahead of Hungary, Austria and Luxembourg. Prior to 1980, only four countries qualified for the finals tournament, and Wales were drawn to play against the winners of Group 3—Yugoslavia—on a home and away basis match. Wales lost the first leg 2–0 in Zagreb and were eliminated from the competition following a 1–1 draw in a bad-tempered return leg at Ninian Park, Cardiff, which was marred by crowd trouble. This initially led to Wales' ban from the 1980 tournament. However, the ban was reduced on appeal to a four-year ban on qualifying matches being played within 100 miles of Cardiff. Yugoslavia went on to finish third in the 1980 tournament. The following year, Wales defeated England on English soil for the first time in 42 years and secured their only victory to date at Wembley Stadium thanks to a Leighton James penalty. Another notable achievement came in the 1980 British Home Championship, as Wales comprehensively defeated England at The Racecourse Ground, Wrexham. Goals from Mickey Thomas, Ian Walsh, Leighton James and an own goal by Phil Thompson saw Wales defeat England 4–1 just four days after England had defeated the then-world champions, Argentina. In the 1982 FIFA World Cup qualifiers the Wales team managed by Mike England came extremely close to qualification: a 3–0 defeat against the Soviet Union in their final match meant they missed out on goal difference, but the real damage had been done by their failure to beat Iceland in their last home match, the match eventually finishing 2–2 after several hold-ups due to floodlight failures. Mark Hughes marked his debut for Wales by scoring the only goal of the match as England were defeated once again in 1984. The following season, Hughes was again on target, scoring a wonder goal as Wales thrashed Spain 3–0 at The Racecourse during qualification for the 1986 World Cup. However, despite defeating Scotland 1–0 at Hampden Park, it was again Iceland that wrecked Welsh hopes by defeating Wales 1–0 in Reykjavík, and for the second World Cup in a row, Wales missed out on goal difference. Wales had to win their last match at home to Scotland to be guaranteed at least a play-off, but were held to a 1–1 draw in a match marred by the death of Scotland manager Jock Stein, who collapsed from a heart attack at the end of the match. Under Terry Yorath, Wales attained what was then their highest FIFA world ranking on 27 August 1993. Again Wales came close to qualifying for a major championship when they came within a whisker of reaching the 1994 World Cup. Needing to win the final match of the group at home to Romania, Paul Bodin missed a penalty when the scores were level 1–1; the miss was immediately followed by Romania taking the lead and going on to win 2–1. Following the failure to qualify, Yorath's contract as manager of the national side was not renewed by the FAW, and John Toshack—the then-manager of Real Sociedad—was appointed on a part-time basis. However, Toshack resigned after just one match—a 3–1 defeat to Norway—citing problems with the FAW as his reason for leaving, although he was sure to have been shocked at being booed off the pitch at Ninian Park by the Welsh fans still reeling from the dismissal of Yorath. Mike Smith took the manager role for the second time at the start of the Euro 1996 qualifiers, but Wales slipped to embarrassing defeats against Moldova and Georgia before Bobby Gould was appointed in June 1995. Gould's time in charge of Wales is seen as a dark period by Welsh football fans. His questionable tactics and public fallings-out with players Nathan Blake, Robbie Savage and Mark Hughes, coupled with embarrassing defeats to club side Leyton Orient and a 7–1 thrashing by the Netherlands in 1996 did not make him a popular figure within Wales. Gould finally resigned following a 4–0 defeat to Italy in 1999, and the FAW turned to two legends of the national team, Neville Southall and Mark Hughes, to take temporary charge of the match against Denmark four days later, with Hughes later being appointed on a permanent basis. Under Mark Hughes, Wales came close to qualifying for a place at Euro 2004 in Portugal, being narrowly defeated by Russia in the play-offs. However, the defeat was not without its controversy, as Russian midfielder Yegor Titov tested positive for the use of a banned substance after the first qualifying leg, a scoreless draw in Moscow. Notwithstanding, FIFA opted not to take action against the Football Union of Russia other than instructing them not to field Titov again, and the Russian team went on to defeat Wales 1–0 in Cardiff to qualify for the final tournament. In Euro 2008 qualifying, Wales were drawn in Group D alongside Germany, the Czech Republic, Slovakia, the Republic of Ireland, Cyprus and San Marino. The team's performance was disappointing, finishing fifth in the group with expected defeat at home to Germany yet an unexpected draw away, a loss away and a goalless draw at home to the Czech Republic, a loss away and 2–2 draw at home to the Republic of Ireland, a 3–0 home win and uninspiring 2–1 away win against minnows San Marino, a 3–1 home win and 3–1 away defeat against Cyprus, and a spectacularly mixed performance against Slovakia, losing 5–1 at home and winning 5–2 away. However, better performances towards the end of the competition by a team containing—of necessity because of injuries and suspensions of senior players—no fewer than five players who were eligible for selection for the under-21 squad was viewed as a hopeful sign of future progress for the team. In 2010 FIFA World Cup qualification – UEFA Group 4, Wales made a promising start, winning 1–0 and 2–0 against Azerbaijan and Liechtenstein, respectively. However, they lost their next match against Russia in Moscow, 2–1, after Joe Ledley had briefly drawn them level. The qualifying campaign showed signs of promise when the team managed to prevent Germany from scoring for 74 minutes of their match in Mönchengladbach, although Wales ultimately lost 1–0. Two 2–0 home defeats by Finland and Germany in Spring 2009 effectively put paid to Wales' hopes of qualification. Wales were drawn in UEFA Euro 2012 qualifying Group G with Montenegro, Bulgaria, Switzerland and close rivals England. Wales lost 1–0 away to Montenegro in their opening match and, on 9 September 2010, John Toshack stood down as manager after being disappointed at previous results in 2010 against Croatia and the opening Euro 2012 qualifier. Wales under-21 coach Brian Flynn took over from Toshack as caretaker manager with a view to a possible permanent appointment, but a 1–0 home defeat to Bulgaria and 4–1 away loss to Switzerland prompted the FAW to pass over Flynn. Gary Speed was appointed as permanent manager on 14 December 2010. Speed's first match as manager was 8 February 2011 in the inaugural Nations Cup, which the Republic of Ireland won 3–0. Speed's first competitive match was the Euro 2012 qualifier at home to England on 26 March 2011, and Speed appointed 20-year-old Aaron Ramsey captain, making him the youngest Wales captain. Wales lost to England 2–0 and in August 2011 Wales attained their lowest FIFA ranking of 117th. This was followed by a 2–1 home win against Montenegro, a 1–0 away loss to England, a 2–0 home win against Switzerland and a 1–0 away win against Bulgaria. Consequently, in October 2011, Wales had rapidly risen to 45th in the FIFA rankings. A 4–1 home win in a friendly match against Norway on 12 November 2011 proved to be Speed's last match in charge of Wales. The match was a culmination of Speed's efforts which led Wales to receive the unofficial award for biggest mover of 2011 in the FIFA rankings. His tenure as manager ended in tragic circumstances two weeks later when he was found dead at his home on 27 November, having apparently committed suicide. Due to London's successful bid for the 2012 Summer Olympics, a Great Britain team would qualify as of right of being the host nation. However, the FAW stressed it was strongly against the proposal. Despite this, Welsh players Aaron Ramsey and Gareth Bale expressed their interest in representing the Great Britain Olympic football team. Bale was ultimately omitted due to injury, but Ramsey was joined by four other Welshmen in Stuart Pearce's 18-man squad: Swansea City's Joe Allen and Neil Taylor, while Manchester United's Ryan Giggs and Liverpool's Craig Bellamy were included as over-age players, with Giggs being made captain. Chris Coleman was appointed Wales team manager on 19 January 2012. For 2014 World Cup qualification, Wales were drawn in Group A with Croatia, Serbia, Belgium, Scotland and Macedonia. They lost their first match 2–0, against Belgium. Their second match, against Serbia, was even worse, finishing 6–1, Wales's worst defeat since the 7–1 reversal to the Netherlands in 1996. In October 2012, Ashley Williams was appointed captain of Wales by Coleman, replacing Aaron Ramsey. Wales won at home against Scotland 2–1, lost away to Croatia 2–0 and won away against Scotland 2–1, but a 2–1 loss at home to Croatia ended Wales hopes of qualifying. Wales were placed in Group B for qualifying for Euro 2016 alongside Andorra, Belgium, Bosnia and Herzegovina, Cyprus and Israel. In July 2015, following four wins and two draws, Wales topped the group. In July 2015, having attained their then highest FIFA ranking of tenth, Wales were placed among the top seeds for the 2018 FIFA World Cup qualification draw. Wales were drawn in Group D with Austria, Serbia, the Republic of Ireland, Moldova and Georgia. In September 2015, England dropped to tenth in the FIFA rankings, making Wales—in the ninth position—the highest ranked British team for the first time in its history. In October 2015, Wales attained their highest ever FIFA ranking of eighth. On 10 October 2015, Wales lost 2–0 to Bosnia and Herzegovina. However, Wales' qualification for Euro 2016 was confirmed after Cyprus defeated Israel that same evening. Wales had qualified for Euro 2016 in France, their first European Championship tournament, and were drawn into Group B with Slovakia, Russia and England. On their Euro debut, on 11 June against Slovakia at the Nouveau Stade de Bordeaux, Gareth Bale scored direct from a free-kick to give Wales a 1–0 lead, and Hal Robson-Kanu scored the winner in a 2–1 victory that put them top of the group. In their second match, against England in Lens, Wales led 1–0 at half-time through another Bale free-kick, but lost 2–1. Against Russia at the Stadium Municipal in Toulouse, Aaron Ramsey, Neil Taylor and Bale scored in a 3–0 win that made them win the group. In their round of 16 match at the Parc des Princes in Paris, Wales played Northern Ireland and won 1–0 after Bale's cross was put in as an own goal by Gareth McAuley. In the quarter-final against Belgium, Wales—the last remaining British team—went behind to a long-range effort from Radja Nainggolan, but captain Ashley Williams headed an equaliser before Hal Robson-Kanu and Sam Vokes confirmed a 3–1 victory for Wales. This victory advanced Wales to their first major tournament semi-final and also made them the first British nation to advance to the semi-finals of a major tournament since England did so at Euro 1996 as hosts. The first half of the semi-final against Portugal in Lyon went goalless, but goals from Cristiano Ronaldo and Nani early in the second half saw Portugal claim a 2–0 win. Wales were welcomed back home on 8 July with an open-top bus parade around Cardiff, starting at Cardiff Castle and going past the Millennium Stadium before finishing at the Cardiff City Stadium. In September 2016, Wales opened their 2018 World Cup qualification campaign with a comfortable 4–0 home win against Moldova. However, they followed this with a run of five consecutive draws away to Austria, at home to Georgia, both home and away against Serbia and away to the Republic of Ireland. That run came to an end with a 1–0 home victory over Austria on 2 September 2017, followed by a 2–0 away victory against Moldova on 5 September and a 1–0 away win over Georgia on 6 October. Wales finished third in their group due to a 1–0 loss to the Republic of Ireland on 9 October and failed to qualify for the final tournament in Russia. Chris Coleman resigned as Wales team manager on 17 November 2017 and was appointed team manager at Sunderland. After nearly two months of managerial vacancy, former Wales national player Ryan Giggs was named Wales' new manager. Giggs, who signed a four-year contract, would be charged with leading Wales' preparations for the start of the 2018–19 UEFA Nations League in September 2018 and qualification for Euro 2020. From 2000–2009, Wales played most of their home matches at the Millennium Stadium, Cardiff. The stadium was built in 1999 on the site of the old National Stadium, known as Cardiff Arms Park, as the Welsh Rugby Union (WRU) had been chosen to host the 1999 Rugby World Cup. Prior to 1989, Wales played their home games at the grounds of Cardiff City, Swansea City and Wrexham, but then came to an agreement with the WRU to use Cardiff Arms Park and, subsequently, the Millennium Stadium. With the opening of the Cardiff City Stadium in 2009, the FAW chose to stage most home friendlies there, with other friendly matches played at the Liberty Stadium in Swansea and the Racecourse Ground in Wrexham. Qualifying matches continued to be played at the 74,500-capacity Millennium Stadium until the end of 2009, which was typically only around 20–40% full amid poor team results. This led to calls from fans and players for international matches to be held at smaller stadiums. For the Euro 2012 qualifying campaign, the FAW decided Wales would play all of their home matches at either the Cardiff City Stadium or the Liberty Stadium, with the exception of the home tie against England, which was played at the Millennium Stadium. The 2014 World Cup qualifying campaign saw four home matches at the Cardiff City Stadium and one at the Liberty Stadium. Cardiff City Stadium's capacity was increased to 33,000 in 2014 and all home matches for Euro 2016 qualifying were scheduled at the stadium and Wales subsequently qualified for the finals tournament in France. All five home qualifiers for the 2018 FIFA World Cup qualification (UEFA) were held at the stadium as well as both of the team's home 2018–19 UEFA Nations League games. All home games in the Euro 2020 qualifying campaign are also scheduled to take place there. A friendly against Spain took place at the Millennium Stadium on 11 October 2018, which was Wales' first match at the stadium in just over seven-and-a-half years, finishing in a 4–1 defeat. A friendly took place at the Racecourse Ground on 20 March 2019 against Trinidad and Tobago which was Wales' first match at the stadium since 2008. The following players were called up for the UEFA European Championship qualifying match against Slovakia on 24 March 2019. Caps and goals updated as of 24 March 2019 after the match against Slovakia. 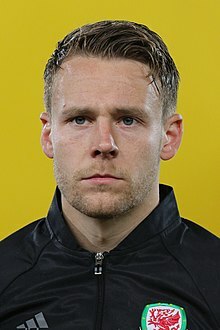 Chris Gunter has played a record 94 times for Wales since 2007. See: List of Wales international footballers. Live television broadcast rights are held by S4C (Welsh language commentary) and Sky Sports (English language commentary) until 2022. The primary kit has long been all-red. The crest of the Football Association of Wales features a Welsh Dragon on a white shield surrounded by 11 daffodils on a green background, and, since 1951, the Welsh-language motto Gorau Chwarae Cyd Chwarae ("The best play is team play"). Wales also progressed through UEFA Euro 1976 qualifying to the quarter-final, which was played on a home and away leg basis, but they did not feature in the finals tournament. ^ "World Cup 1958 Qualifying". Rec.Sport.Soccer Statistics Foundation. 2 September 2015. Retrieved 14 October 2015. ^ Bevan, Chris (17 November 2013). "Paul Bodin on when Wales were a spot-kick away from the World Cup". BBC Sport. Retrieved 17 November 2013. ^ Hughes, Dewi (12 November 2004). "Time for Toshack to deliver". BBC Sport. BBC. Retrieved 12 November 2004. ^ "BBC News – Football – An Englishman over the border". bbc.co.uk. Retrieved 1 September 2015. ^ "Wales reprieve for Savage". BBC Sport. BBC. 5 September 1998. Retrieved 25 July 2015. ^ "Wales consider Euro 2004 appeal". BBC Sport. BBC. 23 January 2004. Retrieved 23 January 2004. ^ "John Toshack stands down as Wales boss". BBC Sport. BBC. 9 September 2010. Retrieved 9 September 2010. ^ "Republic of Ireland 3–0 Wales". RTÉ Sport. Raidió Teilifís Éireann. 8 February 2011. Archived from the original on 11 February 2011. Retrieved 8 February 2011. ^ "Speed's Wales are FIFA's 2011 "Best Mover"". Reuters. 21 December 2011. Retrieved 31 December 2011. ^ "The FAW regrets to announce the death of the national team manager Gary Speed". FAW. Football Association of Wales. 27 November 2011. Retrieved 27 November 2011. ^ "Wales oppose GB Olympic football". BBC Sport. British Broadcasting Corporation. 6 December 2005. Retrieved 6 December 2005. ^ Draper, Rob (26 December 2010). "Aaron Ramsey and Gareth Bale move closer to Olympic contention with Great Britain team". Daily Mail. London. Retrieved 2 January 2012. ^ Nabil Hassan. "BBC Sport – London 2012: Gareth Bale to miss Olympics with injury". BBC Sport. Retrieved 1 September 2015. ^ "BBC Sport – London 2012: Tom Cleverley in Team GB football squad". BBC Sport. Retrieved 1 September 2015. ^ "Chris Coleman – New national team manager". FAW website. Football Association of Wales. 19 January 2012. Retrieved 19 January 2012. ^ "Serbia 6 – 1 Wales". BBC Sport. BBC. 11 September 2012. Retrieved 11 September 2012. ^ "BBC Sport – Aaron Ramsey replaced as Wales captain by Ashley Williams". BBC Sport. Retrieved 1 September 2015. ^ "BBC Sport – Fifa rankings: Wales rise 15 places to highest level of 22nd". BBC Sport. Retrieved 1 September 2015. ^ "BBC Sport – Mark Hughes hails 'huge' Wales top seeding boost for World Cup". BBC Sport. Retrieved 1 September 2015. ^ "BBC Sport – Fifa rankings: Wales enter world top 10 for first time". BBC Sport. Retrieved 1 September 2015. ^ "Euro 2016 qualifiers: Wales above England in Fifa rankings". BBC Sport (British Broadcasting Corporation). 3 September 2015. Retrieved 14 October 2015. ^ "Bosnia 2 Wales 0". BBC Sport. 10 October 2015. Retrieved 13 October 2015. ^ Pritchard, Dafydd (11 June 2016). "Wales 2–1 Slovakia". Retrieved 2 July 2016. ^ McNulty, Phil (16 June 2016). "England 2–1 Wales". BBC Sport. Retrieved 2 July 2016. ^ Pritchard, Dafydd (20 June 2016). "Russia 0 Wales 3". BBC Sport. Retrieved 2 July 2016. ^ "Wales 1 Northern Ireland 0". BBC Sport. 25 June 2016. Retrieved 2 July 2016. ^ Pritchard, Dafydd (1 July 2016). "Wales 3–1 Belgium". BBC Sport. Retrieved 2 July 2016. ^ McNulty, Phil (6 July 2016). "Portugal 2–0 Wales". BBC Sport (British Broadcasting Corporation). Retrieved 7 July 2016. ^ "Euro 2016: Wales players to get homecoming celebration". BBC News (British Broadcasting Corporation). 7 July 2016. Retrieved 7 July 2016. ^ Pritchard, Dafydd (5 September 2016). "Wales 4–0 Moldova". BBC Sport. Retrieved 19 June 2018. ^ "Chris Coleman leaves Wales role for Sunderland job". BBC Sport. 17 November 2017. Retrieved 19 June 2018. ^ "Ryan Giggs: Manchester United legend named Wales manager". BBC Sport. 15 January 2018. Retrieved 19 June 2018. ^ "Will Vaulks: Rotherham United midfielder named in Wales squad". BBC Sport Wales. British Broadcasting Corporation. 12 March 2019. Retrieved 12 March 2019. ^ Alpuin, Luis Fernando Passo (20 February 2009). "Wales – Record International Players". Rec.Sport.Soccer Statistics Foundation. Retrieved 10 March 2009. ^ Rob Phillips. "BBC Sport – Euro 2016: Who are Gareth Bale's rivals to be Wales' first centurion?". BBC Sport. Retrieved 1 September 2015. ^ "THE MESSAGE ON OUR CHEST". Football Association of Wales. 19 May 2014. Retrieved 9 January 2018. Wikimedia Commons has media related to Wales national association football team.